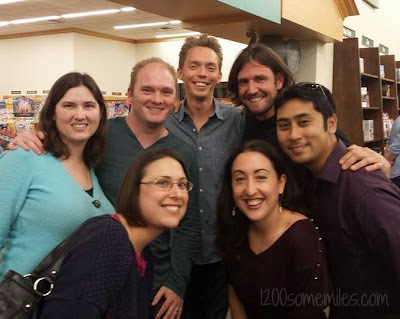 Last week I went to hear The Minimalist speak at a local Barnes & Noble. We sat front and center since the other seats were "Reserved." I had heard of The Minimalists before 2014, probably because they were two guys from my hometown with a growing blog. I had also heard of some other minimalists bloggers (Courtney Carver, Joshua Becker, and Leo Babauta), but I did not begin to regularly follow them until the beginning of this year. I think that a turning point for me literally was January 1. We had a very long travel day from Dayton, Ohio to San Francisco. We were rerouted due to snow in Chicago (shocking! ), so I wanted a book to read. I chose You Can Buy Happiness (And It's Cheap) by Tammy Strobel. I think that the title spoke to me. My journey towards simplicity and minimalism kicked off as we returned from our holiday travels. I started regularly reading some minimalism blogs and read two books by The Minimalists. I enjoyed them both, and Minimalism: Live a Meaningful Life really resonated with me. At the beginning of February I got our free tickets for The Minimalists Tour. At that time, the event seemed far in the future, but now it has come and gone. At the end, they sign books and give hugs. My friend had her new book signed, and we got a group picture. In briefly meeting Joshua and Ryan, I said, "Thanks for sharing." At first it sounded silly, but I realized that it expressed my gratitude for those who share their imperfect journeys with the world. A few months into 2014, I can see the focus on simplicity and minimalism starting to have a positive influence on my life. I am more willing to part with extra stuff and clutter. I am focusing on my priorities, goals, and living a meaningful life. I know that I still have a ways to go on this journey.